Today was another so-so day! Health-wise, I woke up with light pains in my shoulder blades and right rip location. I also had a little bit of dizziness and stomach issues, I took my medication, which helped eliminate the two. I rested for a bit before I ate some toast and had some tea. My stomach settled down allowing me to take my morning medication. For most of the day, my stomach felt a bit fluffy and the pain levels were manageable. Activity-wise, again, there is not much to report. Dianne had taken off from work today. After getting up and having breakfast, it started to rain, which canceled my morning walk with Dianne. 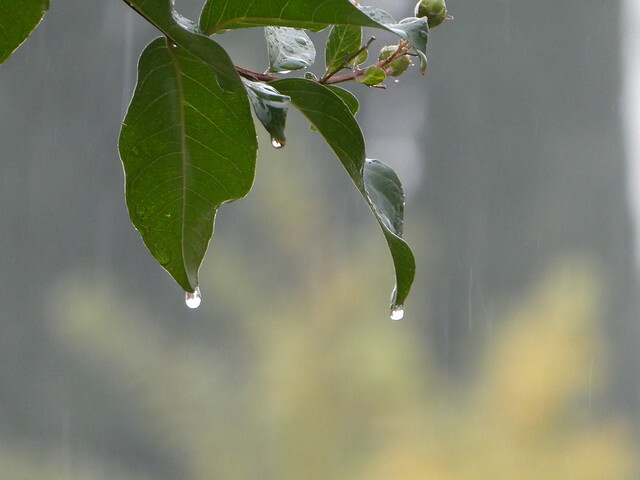 I did, however, took some PICTURES of the rain around the house. Since my system was a bit down, I rested to be ready for my radiation session today at 12:20. After lunch, Dianne took me to the Cancer Center, as it turned out, due to some server issues, my session did not start until 13:00 (1 PM). I, therefore, waited in the Library until the start of my radiation session. I was done with radiation a little bit after 14:00 (2 PM). Shortly after that Dianne took me home, with a detour stopping at Walmart for some needed groceries for tomorrow, Thanksgiving dinner. Getting back home I uploaded today’s pictures and started this entry, which I finished after dinner. The day ended as most days, watching TV after dinner to relax before calling it a day. In short – It was a so-so day. 2018-11-21 – Let it rain!! !